This entry was posted in pattern, pictures, posts without words and tagged graph, hypercube, projection, subset, symmetry. Bookmark the permalink. I will add a few words in a comment: the idea for this image came from Denis Moskowitz, who posted a link to an image he had made, http://suberic.net/~dmm/flower.png , and then explained it in more detail in some subsequent comments: https://mathlesstraveled.com/2017/03/30/post-without-words-13/#comment-27603 . I decided I wanted to try to make a version of the image that contained even more encoded information. Yeah, I realized that I switched it from your description, but of course the two are entirely dual. Putting the full set in the center made more sense to me for the purposes of actually drawing the sets, so it is dense in the middle and thinning out towards the edges of the diagram. Also it’s interesting to see that it can work with circular arcs. Yeah, I decided to try circular arcs since I wanted a simple rule that could generate all the edges automatically — I didn’t want to go through and position each class of edges by hand. In particular, when connecting points p and q, assuming p is farther from the origin, I always connect them using a circular arc which is tangent at p to the circle through p centered at the origin. (I spent a fun fifteen minutes drawing triangles and vectors and the law of sines etc. figuring out how to compute that.) Of course this also means that pairs of symmetric arcs coming out of a given node lie on the same circle, which looks nice. It’s not perfect—for example, the nodes in the second-to-last layer, with a pair of adjacent elements, have edges that cross just beneath / touching them, and I’d rather there was a little more clearance there—but overall it works pretty well. Oh, fascinating! I didn’t realize there was a nice rule to describe your curves. I’ll have to try that too. Visualising the connected nature of all subset combinations is absolutely stunning. Thank you for creating this and sharing it. It seems that the choices of set size, n, are limited. Obviously n = 2, 3 are straight forward and n = 5 works because C(5,1) = 5 and C(5,4) = 5 divide into C(5,2) = 10 and C(5,3) = 10. But for n = 4 you have the conflict of C(4,1) = 4 and C(4,2) = 6 and we lose rotational symmetry. 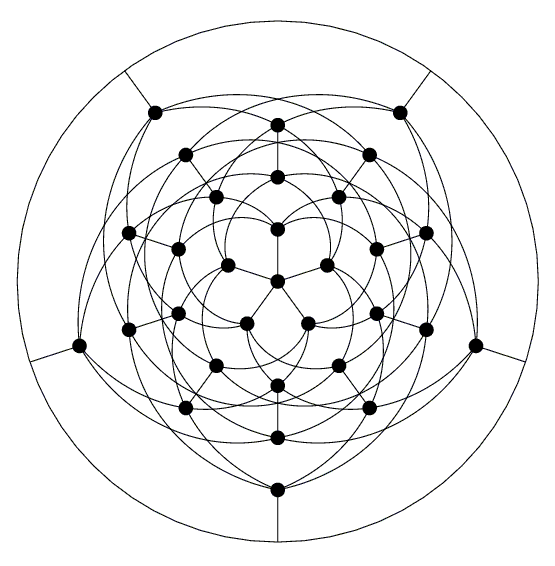 Is there a rational choice that can be made to create a hexagon within a square (and similarly for other values of n) that has symmetry, even if it isn’t rotational? I guess it loses the elegance of this particular mapping. We had a discussion of this in the last PWW comments. I think you might be able to make something similar with N-4 but a quick sketch makes me think it would be quite tangled. Would still love to see someone try! I think that 2,3,5 are the only ones that would work. You want C(n,k) to be a multiple or factor of C(n,k+1) so that the kth and k+1st rings mesh. For this to happen, you need (n-k+1)/k to be an integer for k <= n/2. This means that k is a factor of n+1, whence the lcm of 1,…,n/2 (with floor function applied to n/2 if n odd) is n+1. Turning that around, we're looking for m such that lcm(1,…,m) divides 2m. But m and m-1 are coprime, so the lcm of 1,…,m is a multiple of (m-1)m. For m at least 4, this is at least 3m and we don't get a solution. So we get three solutions, corresponding to m=1,2,3 with lcm(1,…,m) equal to 1,2,6. Noting that 1 divides 3, and 2 divides 4, gives the three solutions with n=2,3,5. Back to the picture, what licence are you putting with it? I'd like to either print it off or (maybe) remix it to make a poster for my classroom. I think it's a great one for "What questions do you have?" 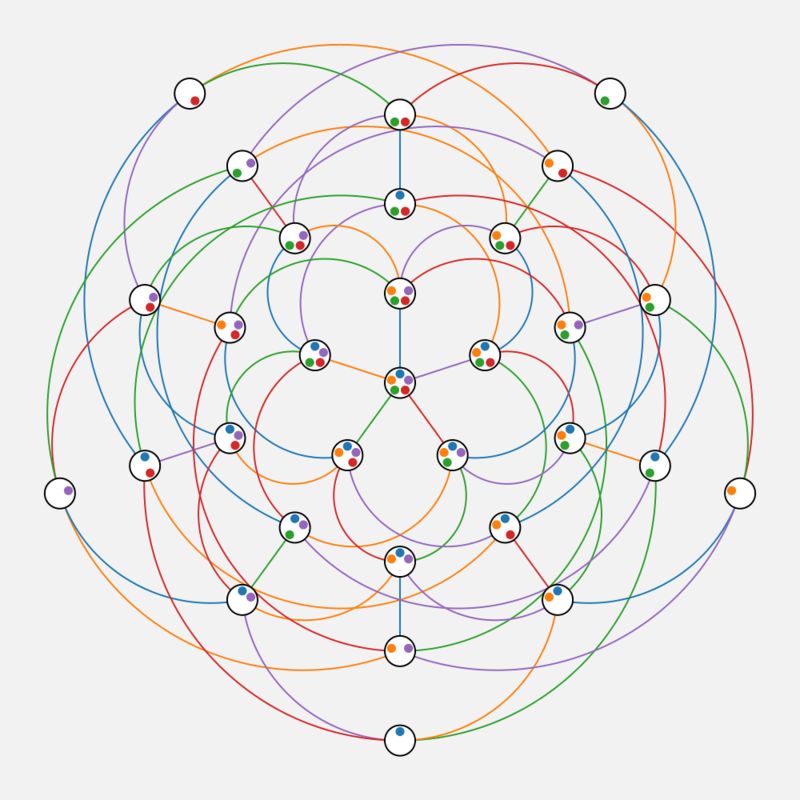 PS I think that n=11 is the next one with decent rotational symmetry. Only the k=5 ring will be out of step. Ah, nice analysis. As for the license, everything on my blog is under a CC-BY-NC-3.0 license: https://mathlesstraveled.com/license/ . So you can definitely use it, remix it, etc. for your classroom. I agree it would be a great prompt to get students thinking and asking questions! Thanks, glad you enjoyed it! I think I agree with Denis, there’s not really a good way to do n = 4 that works well. You can of course put a hexagon outside a square in a way that at least has some symmetry, but then the problem is that the edges don’t end up being symmetric. For n larger than 5 it gets very complicated, I suspect there simply isn’t enough room in 2D (though I also wouldn’t be surprised if it turns out that there is an extremely nice layout for n = 24 or something crazy like that). It does raise the question of whether there are nice symmetric projections in other dimensions. I’m sure this has all been studied before, I think it really comes down to group theory.